Perhaps it’s because I’ve just listened to a lot of trance/ambient/world/new age music . . . but Tandava vol 2 is just not my cup of tea. Overall, the album tempo is slow, and the vocals tend to be more on the ‘wailing’ side than ‘chanting’ (which is pretty annoying). 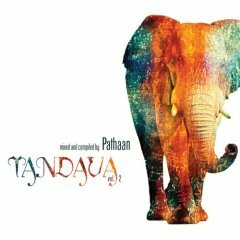 Not every album needs to be groovy, but while other musicians achieve a down-tempo feeling Pathaan has only created a downer. Even the potentially meditative “Heartbeats” just ends up feeling lugubrious rather than contemplative. “Raja Mati” is moderately upbeat, but there are no surprises here – it’s a pale imitation of world-influenced club music circa 1990 (and Enigma did it better). Aurora and To the Shore are the most approachable songs on the album, marred only by an over-reliance on a drum machine. This is a middling album – it’s technically sound, and basically just fine. Just because it didn’t knock my socks off doesn’t mean it’s not worth taking a listen. You may like it better than I did.